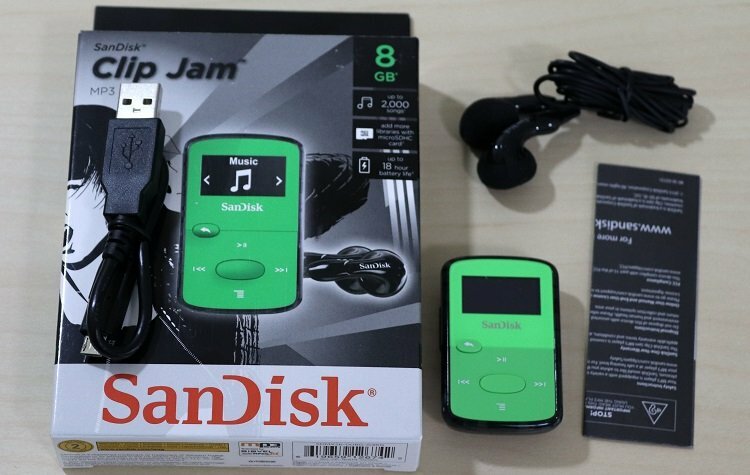 The Sandisk Clip Jam is probably the most popular MP3 player on the market. It’s small, almost too small for kids, has a clip that’s great for running, and some good features. Today, we’re putting it up against 4 other top rated MP3 players in its price range to see if it’s really as good as everyone says it is. This is part of our series on the best MP3 players for kids. We purchase these products in order to unbox them, review them, and give unbiased information to consumers. The design of the Sandisk Jam is almost perfect. In fact, I think I like the smaller screen more than the 1.44” TFT LCD Clip Sport version. It’s affordable at under $30 and comes in 5 different colors. The clip, which will talk a bit more about, easily secures the Jam to your shirt or pants. 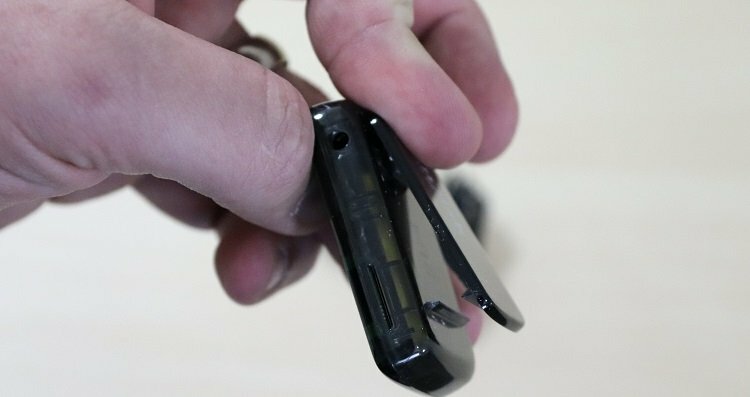 The Clip holds up to 8GB and is expandable with a built-in micro SD card slot. I transferred 75 files in around 2 minutes and 30 seconds with 545MB of data. This is fairly standard speed for USB 2.0. Along with the Clip Jam you receive earbuds, a short 6-inch USB to USB mini charge cable, and a small instruction manual. The earbuds for this model are fairly poor in quality. They’re good enough to use some of the time but they feel like the kind you get for cheap on an airplane. They have a foam cover over large inserts that feel uncomfortable in your ear. Like all the models we reviewed except for one, these went unused. Instead, I used an inexpensive pair of sport earbuds I purchased for around $12. This changed the quality of the audio drastically. For the audio quality of the Jam as well as other models reviewed here, I found the earbuds to be the most important factor. However, the clarity of the Sport seemed a bit better. The volume went as high as I’d like it to go or to the point where your ears start hurting. Since there’s no lock hear for the screen and volume, this might not be the best option for young kids. However, for kids older than 8, this should be just fine. If you want Bluetooth, try the Sandisk Clip Sport option with Bluetooth. It costs a bit more but does include this option. I was expecting Sandisk to be the best option, in terms of the tuning, that I was able to get out of the models I reviewed. Apparently, the headphones have something to do with the tuning. I don’t know too much about that. However, I can say that I used the same headphones on all of these models for the radio. Inside, I couldn’t get my local stations clearly. They were a bit fuzzy. Outside this would probably work ok; however, if you run indoors, don’t expect any miracles. Out of all the models I reviewed, the menu of the Sandisk Clip Jam was the clear winner. It’s intuitive, easy-to-use and not something you really have to think about. I can’t say that about the other models. The screen is bright, doesn’t try to turn itself into a pixelated MP4 player, and doesn’t pause when you select an item. Win. The clip is incredibly useful for running, mowing the lawn, or even doing chores. This makes it more convenient to use around the house than something like a cell phone. Overall, this is the MP3 player I’d want to use. The menu is intuitive, the clip is great, it’s durable, has a few fun colors, a slim design, and doesn’t try to do more than it was made for. However, some of the other options may be better suited for kids. 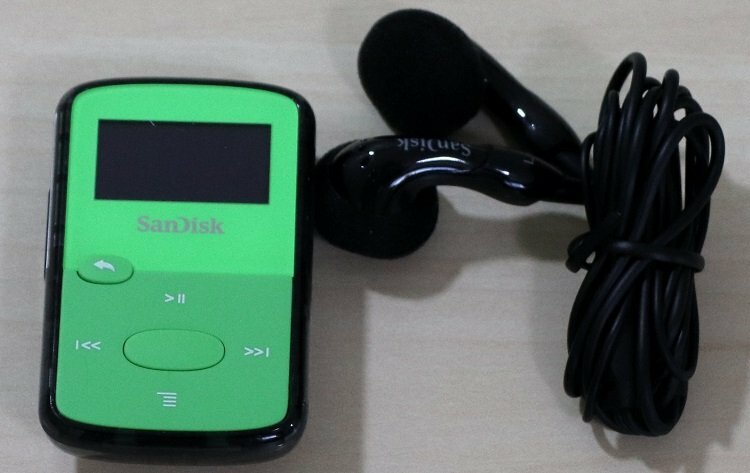 If you want more information about that, be sure to check out our post on the best MP3 player for kids. If there’s one disappointment here it was the clarity of the radio stations I was able to get with it. If that’s something you’re looking for you may want to think twice. In addition, while this MP3 player does allow for Audible Books, my favorite experience for that is certainly on my phone.